Everything Rachael Ray: A Rachael Ray Cartoon? Rachael is developing a cartoon, featuring herself as a young chief, for a January 2009 release throught Oprah’s Harpo Productions. I think anytime it says "Insider" as the source, it's usually a load of you know what, but this is plausible, since Rachael's Yum-o! Organization is aimed at helping kids eat right. Plus, she's got a cookbook just for kids, called Cooking Rocks!. This would be another effective way to reach kids, don't you think? So, true or not true? I'm still on the fence. I guess we'll just have to wait & see. It really wouldn't surprise me though . . . 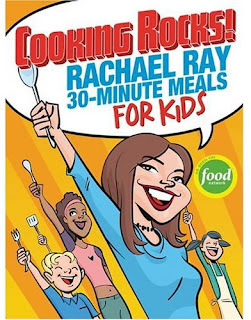 I hear a lot of parents mention how much their kids love watching Rachael Ray. So I guess it isn't that far fetched? That's very true - she has a huge number of fans that are kids. I'll keep my eye out for it!